I have a secret to share. Most baked French toast recipes require an overnight soak in the fridge. My secret is that I really believe there's only a marginal improvement if you take the time to do that. So if, on a whim, you decide one cozy Sunday morning that you want baked French toast, don't despair! Just make it anyways. You can't really go wrong with bread, eggs, butter, and sugar. Ever. The original Pioneer Woman recipe called for butter for serving. She wants you to drizzle melted butter over this before serving it. Seriously. That just sounds obscene even to me, so I took it out. Ick. 1. For the French toast: Grease the baking pan with butter. Tear the bread into chunks, or cut into cubes, and evenly distribute in the pan. Crack the eggs in a big bowl. Whisk together the eggs, milk, cream, granulated sugar, brown sugar and vanilla. Pour evenly over the bread. Cover the pan tightly and store in the fridge until needed (overnight preferably). Or you can make it and bake it right away---delicious no matter what! 2. For the topping: Mix the flour, brown sugar, cinnamon, and salt in a separate bowl. Stir together using a fork. Add the butter and with a pastry cutter, and mix it all together until the mixture resembles fine pebbles. Store in a plastic bag in the fridge. 3. When you're ready to bake the casserole, preheat the oven to 350 degrees F. Remove the casserole from the fridge and sprinkle the topping over the top. 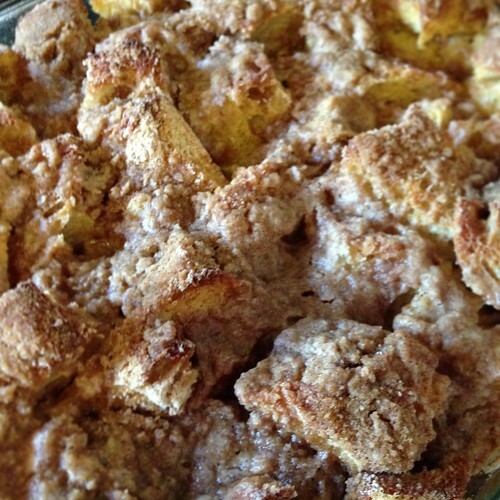 Bake for 45 minutes for a softer, more bread pudding texture or for 1 hour-plus or more for a firmer, crisper texture. 4. Scoop out individual portions. Drizzle with warm pancake syrup and sprinkle with blueberries.